Life's a beach and then you dive! 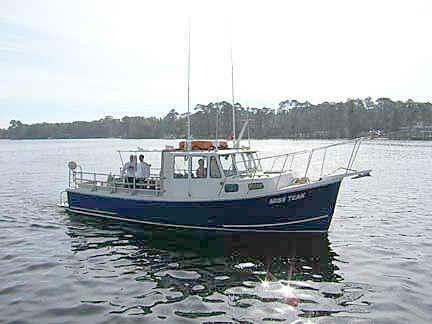 Our boat, M/V Miss Teak, is located at 104 Miracle Strip Pkwy, Fort Walton Beach, FL 32548. For scuba diving in Florida, on the Emerald Coast, we here at Sea Pal Dive Charters have been faithfully serving divers for 18 years. Our goal is to take you to the best dive sites in the Destin/ Ft. Walton Beach area, while providing you with unforgettable service! So if you've been diving for a few days or a few decades, give us a call and let us help you achieve adventure or relaxation while enjoying our underwater world. If you have not been diving in a year or more, a dive master/dive guide will be required. This will allow you to relax, get some degree of skills update which adds to your safety and security plus a much more enjoyable dive. It is advisable that if you have never dove the Gulf before in our area, a dive guide is advised. A standard 2 tank trip (tanks not provided) is $90.00 per diver. Weights on board if needed. For dive shops or instructors who would like to use our boat for open water classes or advanced classes, please contact Sea Pal Dive Charters (850) 689-3483 for special rates. If you would like to join us on one of our diving adventures, a reservation is required at least 24 hours in advance (sorry, no walk-ups accepted). 1. A major credit card and compete billing address. The card will be charged 48 hours before the trip unless other payment options are arranged. 2. Valid phone numbers where we can contact you while in the area and at home. We have a 24 hour cancellation policy whereas you must cancel by phone at 1-850-689-3483. There is an answering machine on at all times. If you do not cancel at least 24 hours before the departure time, you will still be responsible for the trip.